This recipe has been in my family for as long as I can remember. 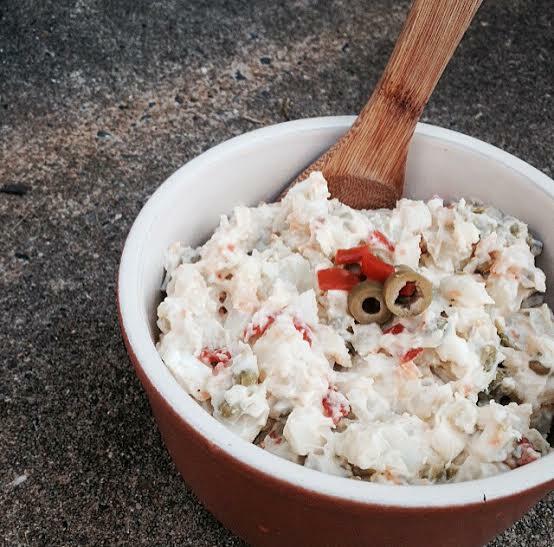 It’s our own Brazilian potato salad with lots of Latin flavor. One of my favorite things in this are the hearts of palm. They remind me of artichokes. Once you give this potato salad a try you can say bye bye to the traditional potato salad, as it is always a crowd pleaser. In a large bowl add cooked potatoes (chopped in cubes), salt & pepper, toss together. Next add all of the remaining ingredients and fold everything together until well incorporated. I love family recipes. Thanks for this. Can we swap palm with anything?? Awesome! Ever since I was a kid and had potato salad with an egg in it, I’ve been a firm believer that eggs really take a potato salad to the next level. The heart of palms also sounds great.